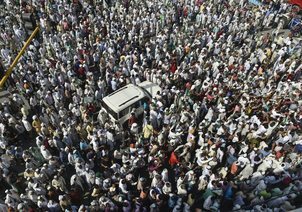 Ghaziabad, As thousands of farmers tried to enter the national capital in a massive protest march, the government Tuesday announced that a committee of chief ministers will look into their demands, even as the protesters stayed put saying they were not “satisfied” with the assurance. After meeting the protesting farmers at the Delhi-UP border here, Union Minister of State for Agriculture Gajendra Singh Shekhawat said the government was assuring the farmers to take forward their cause. “I assure you all this. We will move court over the NGT order (to ban tractor and vehicles which are more than 10 years old),” he said. On another problem faced by the farmers about farm labour, the minister said the government would look at bringing in some changes to the minimum wage rules for rural areas to solve this problem. “The government has formed a committee of six chief ministers to look into this issue of labour for farm. The committee is in talks to connect MNREGA with agriculture,” Shekhawat added. “On behalf of (Union Home Minister) Rajnath Singh, I assure you that I will represent the farmers’ interests in this committee and whatever changes would be required to link MNREGA with agriculture will be made,” Shekhawat told the farmers. The protesting farmers, however, decided to stay put at the Delhi border, where they have been stopped by the police from entering the national capital. Naresh Tikait, the chief of Bharatiya Kisan Union (BKU), which has given the protest call, said the farmers are “not satisfied” with the government’s assurance. “We will discuss this and then decide on future course of action. I cannot decide anything alone, our committee will take the decision,” he added. The farmers were marching towards Delhi over demands ranging from farm loan waiver to cut in fuel prices, but were stopped at the Delhi-Uttar Pradesh border with police using water cannons to disperse them. The farmers, riding tractors and trolleys, broke barricades of the UP Police and then started proceeding towards the barricades put up by the Delhi Police, a senior police officer said.